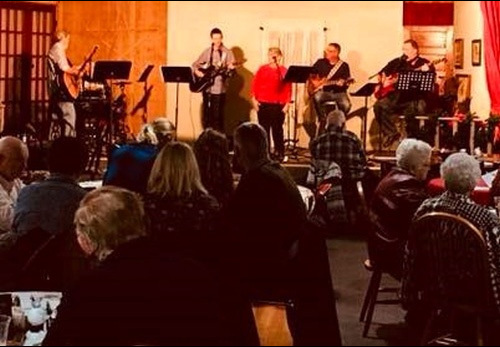 During the winter months, an inviting and warm atmosphere has been provided by WILLow LeaVes when partnering with area churches to bring a blended service, The Cross, to our community. The final winter service will be a little different on Sunday, April 8th. As always, there will be complimentary drinks and cookies. From 5 to 6 p.m., WILLow LeaVes will also be offering a smoked pork chop dinner or a salad bar with soup as well as several desserts and hot dogs with chips for kids, all at a very reasonable price. And, you might as well take a few minutes to browse around their interesting store. Around 6 p.m., the Community Children's Choir, under the leadership of Susan & David Brown, will perform. This wonderful choir consists of children in grades one through six, and they have been practicing hard for months. They will also be presenting "Go, Go Jonah" at Hope United Methodist Church on Sunday, April 29th at 6:30 p.m. You will want to mark this date on your calendar too! Then, Worship Leader Dale Sechrest will lead in some inspirational music with The Cross Band (Instrumentalists Mark Fisher, Tony Garrison, Mark Neafus, & Avery Tallent; Vocalists Marissa Fisher, Sharron Harker, & Brandy Walters; Sound Technicians Ben Cleland & Pat Walters). Pastor Andy Kilps will deliver a short and meaningful message. Avery Tallent, a young and talented songwriter and performer, will close the service by sharing original songs off of his new CD with The Cross Band, a group he has been a part of for several years. "Perfect Love" started evolving in Avery's journey following God. Several of his songs were written after a recent Walk to Emmaus. Lately, he has been involved in a prison ministry which has generated even more songs. His CD will be available through a free will donation. Reservations are not necessary but helpful, 812-546-0640.